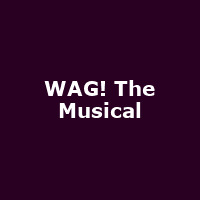 "WAG! The Musical is a contemporary comedy musical featuring brand new songs and a circus of characters straight out of 'Hello'; 'OK! '; and 'The People's Friend'! Set in an imaginary 'Mega Store', 'Any Town', we join Jenny and Sharron, two single mums who work for commission on the cosmetics counter of this busy city centre departmental haven. Daily they encounter the widest range of customers from the bumbling plain Jane (convinced the make-up ladies can transform her into an irresistible beauty), the incontinent widowed pensioner (looking for company); to our all conquering team of WAGs! Add to the mix an assorted mob of adulterous males, lies, and fading hopes of any lasting happiness ... all lorded over by an 'Acidic Queen'. This is the gift wrapped mixture called 'WAG! The Musical' a show of and for our times." The 2013 Charing Cross Theatre run stars Olivier Award-winning west end star Tim Flavin.